No time for YOGA? No Problem! Ever said “I’d like to do some yoga, but don’t have the time”? So many of us have little disposable time and this small amount is really precious to us. We wish we had longer days to be able to fit it all in. We juggle several different commitments and responsibilities and some of us end up putting self-care last; getting to the end of the day exhausted and once again pushing it back to tomorrow. And so we carry on, only until our batteries run out and we are forced to take a break and learn to care for our mental and physical wellbeing. How good would it be if you could take care of that at work? Some businesses have already started offering wellness benefits to their employees. Companies that offer yoga and meditation at work are seeing great return on investment*. Taking a break from work, focusing on breathing, consciously moving can make you more productive when you return to your desk. It can allow you to relax and sharpen your mind, meaning work will then be done to higher standards, and more efficiently, too. Does your office offer Yoga at work? If so, make sure you book onto the next class ASAP! If these services aren’t available yet, suggest bringing them in. As an ex office worker, I know how little time there is for self-care in a busy environment, occasionally skipping lunch or even delaying that much needed drink of water as things need to get done! Now, as a full time yoga teacher, my aim is to bring some balance in your life, allowing you to work more productively and to take care of yourself too. 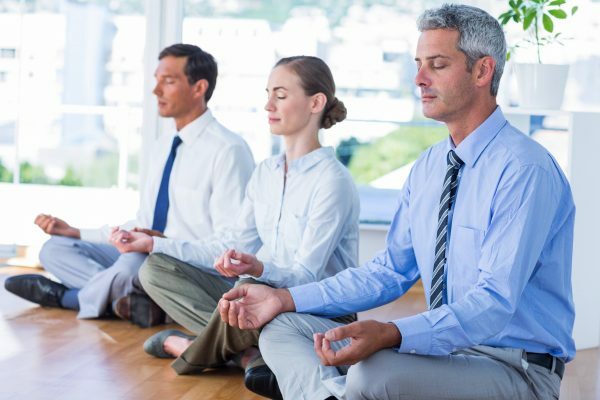 Suggest your HR department gets in touch to discuss arranging Corporate Yoga and/or Meditation at your work place. It may make a difference to how you feel about getting back to work on Monday mornings!